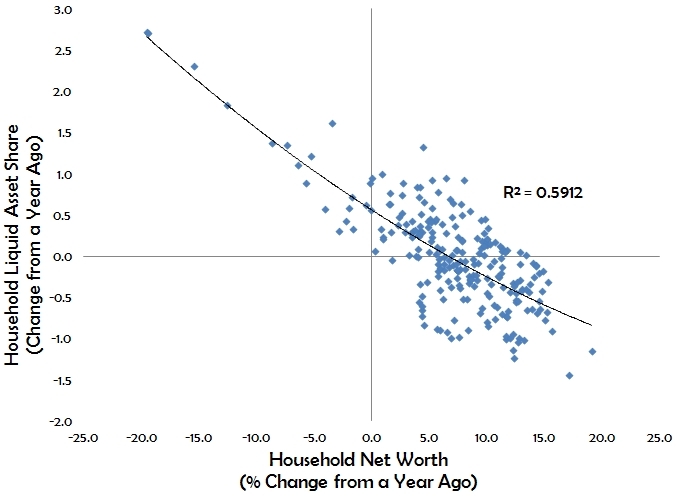 I think that Bullard makes a persuasive case that the amount of household wealth evaporated along with the crash in house prices should likely be viewed as a "permanent" (highly persistent) negative wealth shock. Standard theory (and common sense) suggests a corresponding permanent decline in consumer spending (with consumption growing along its original growth path). The implication is that the so-called "output gap" (the difference between actual and "trend" GDP) may be greatly overstated by conventional measures. To some extent the CBO agrees with Bullard. They have adjusted their potential real GDP estimates below pre-crisis trend path values. Still, there remains a large output gap, one that Bullard finds questionable given the negative wealth shock. So how much is the output gap is overstated? And how do we know which measure of the output gap to trust? These are hard questions and I am not sure they are even the right ones to be asking. I believe a more constructive approach is to consider whether there still remains monetary problems that could be addressed by monetary policy. To begin thinking about whether monetary problems remain, and doing so in light of Bullard's concens about a negative wealth shock, consider the figure below. 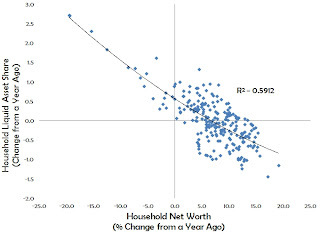 It shows for the years 1952:Q1 - 2011:Q4 the percent change from a year ago of households net worth plotted against the change from a year a ago of households liquid asset share (i.e. 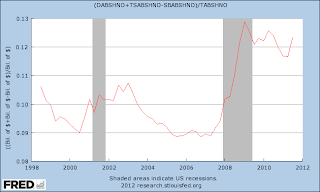 currency, checking accounts, saving and time deposits, retail money market funds, and treasuries as a percent of total household assets). This liquid asset share can be interpreted as a measure of household money demand. Household's elevated demand for retail money assets, however, is only part of the current monetary problem. There is also an elevated demand by large institutional investors for transaction assets that facilitate exchange (commercial paper, treasuries, repos, large-time deposits, institutional money market funds, etc.). Unlike retail money assets, though, which have grown in response to the spike in retail money demand, the problem here is that the elevated demand for institutional money assets has occurred as their supply has fallen. This can be seen in the following figure that shows monetary divisia aggregates through M4. These measures include the retail money assets but also institutional money assests (i.e. M4 divisia = M2 assets plus commercial paper, treasuries, repos, large-time deposits, institutional money market funds weighted appropriately). Since M2 has risen, the reason for the M4 divisia decline in the reduction of institutional money assets. As I have argued before, the failure of the Fed to restore nominal incomes to their pre-crisis expected path (even after accounting for the slightly higher levels during the housing boom) both reduced institutional money assets while increasing the demand for them. The Fed could breach this gap by adopting a nominal GDP level target that restored aggregate nominal income to a reasonable pre-crisis path. This should be the focus of James Bullard's efforts. Forget the output gap, start worrying about the aggregate nominal income gap. P.S. Josh Hendrickson has a forthcoming paper where he shows that the Great Moderation can be traced to the Fed effectively targeting nominal income. 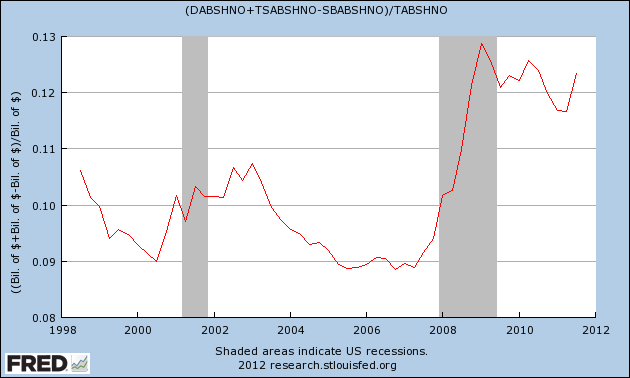 The failure of the of the Fed to keep doing so in late 2008, early 2009 explains many of our economic problems today. Superb post, really good work. And that Divisia chart makes me want to drink heavily for the rest of the day. Why is out central bank doing this to us?